Before I delve into the details of how to take the trains, let me help you understand some of the basic information about the system. What is the New York City subway system? The subway system is the main public transportation system in New York. It is one of the oldest and largest public transportation systems in the world (in terms of number of stations). With some 5.7 million riders on a given weekday, it is one of the primary modes of transportation for the majority of New Yorkers and tourists. The system is operated by a subsidiary of the Metropolitan Transportation Authority (MTA). The subway system is usually just referred to as the "trains." Locals say "I can take the train to your place" to generally mean that they take the subway. The subway is never referred to as the metro, underground, or tube. Unless noted otherwise, I mean the subway system if I just use the word train by itself. While trains mostly run underground in Manhattan, a good portion of trains run on elevated tracks in the other boroughs. The whole subway system operates 24 hours a day, 7 days a week. It essentially never closes, except for major incidents such as hurricanes. What is not the New York City subway? With the exception of the AirTrains, these trains are also referred to as "commuter trains" because commuters from outside New York take these to commute in and out of the city on a daily basis. This guide does not apply to any of these transportation systems. To avoid confusion, some locals refer to these transportation systems by their names. They'll say, "I'm taking Metro-North this weekend," "Let's take New Jersey Transit to the airport," or "I'm coming in from the PATH train." The New York subway system operates in Manhattan, Queens, Brooklyn, and the Bronx. It never leaves New York City. You have to take one of the commuter trains mentioned previously to do so. The Staten Island Railway is a separate train system that runs on Staten Island only. Even though it is often depicted on the New York subway map, there does not exist a physical connection between the two systems. You have to take the (free) Staten Island Ferry or cross the Verrazano-Narrows Bridge to get to Staten Island. However, there is a free transfer between the two systems (you pay only once in one system, and the second swipe with the same farecard within two hours will be free in the other system). This grid system is not perfect. For instance, 4th Ave is named Park Ave for most of its stretch and the grid system does not really exist below 14th St. However, the concept of this grid suffices for now. Keep this concept in mind as it will help you find subway stations and navigate maps. 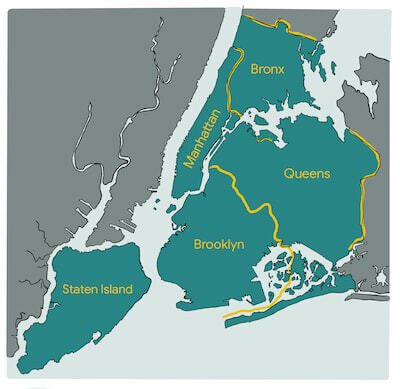 While Uptown, Midtown, and Downtown are geographic regions of Manhattan, the words uptown and downtown can also mean the direction of travel. If you head north (towards the Bronx or Queens), most people say you are headed "uptown"; if you head south (or towards Brooklyn), most people say you are headed "downtown." Locals rarely use the words "north" or "south".